The names in the 2011 Ultraman World Championships record books will look a little familiar. Ribeiro had the quickest combined time over three days, crossing the finish line in 22 hours, 9 nines and 54 seconds. Monforte was the top woman, and sixth overall, with a time of 24:15:13. Ribeiro had to hunt down Ultraman rookie Michael Coughlin, 38, of Canada on the 52.4-mile Hawi-to-Kona run. Also in the mix heading into Day 3 was two-time former champion Jonas Colting, 38, of Sweden, who dropped out of the run with hip pain. Ribeiro, who also won the Ultraman world titles in 2003, 2005, 2008 and 2009, said he was thrilled to win again in Kona. Race director Jane Bockus said she was pleased to see Ribeiro have a good race after last year’s fourth place finish. He was hampered by an upset stomach all three days. Ribeiro agreed this year definitely stands out over last year. In second place, Coughlin made a remarkable debut in the Ultraman World Championships, less than 10 minutes behind Ribeiro at 22:19:08. 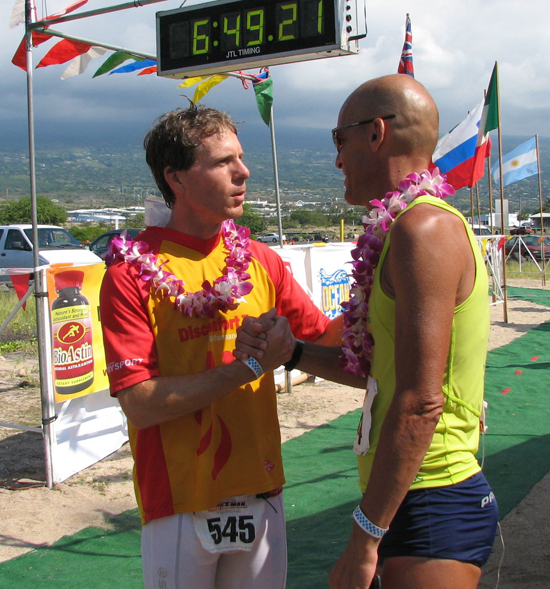 He served as an Ultraman crew member in 2005 and was back in Kona again in 2006 to race in Ironman. Coughlin said he was especially appreciative of the friendly, supportive atmosphere between athletes and their crews. Third overall was Ribeiro’s friend and sometime training partner, Miro Kregar, 49, of Slovenia, who had the day’s best run time of 6:24:10. His total time was 23:33:11. Monforte set the all-time women’s record at the Ultraman distance last year, with 24:07:11. The time might have been slower this year, but the world crown is still hers. “It was hard. Day 1 was awesome, but Day 2 was tough. You just had to go a lot slower, just to be safe,” she said. Although Monforte was sick and fought injuries earlier this year, she said she wouldn’t have missed the race. Most notable during this year’s three-day 320-mile triathlon were the high winds during Saturday’s bike leg. With gusts exceeding 50 mph along the Kohala mountain road, several athletes gave up trying to ride and walked their bikes. Bockus conceded the conditions were insanely tough, even for the Big Island. “The winds were horrendous. I haven’t seen it like that since 1999,” she said. Support crews trailing the athletes in vans reported seeing bikes blown clear across two lanes and cyclists leaning over at impossible angles to compensate for the wind. 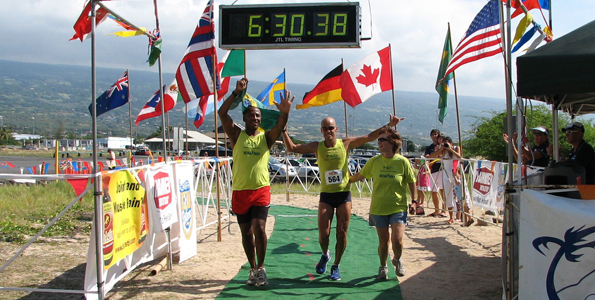 One of the athletes who did not finish was Amy Palmiero-Winters, who was the first athlete with a below-the-knee prosthesis to attempt the Ultraman course. Palmiero-Winters, who won the 2010 ESPY Award for Best Female Athlete with a Disability, missed the cut-off time on Day 1, but continued to race and missed the Day 2 cut-off time by 7 minutes. She attempted Sunday’s run, but had difficultly with her prosthesis and dropped out. Also dropping out were Rich Roll with a fever and lung congestion and Mike Rouse, who crashed his bike early on Day 2 and suffered a broken arm. 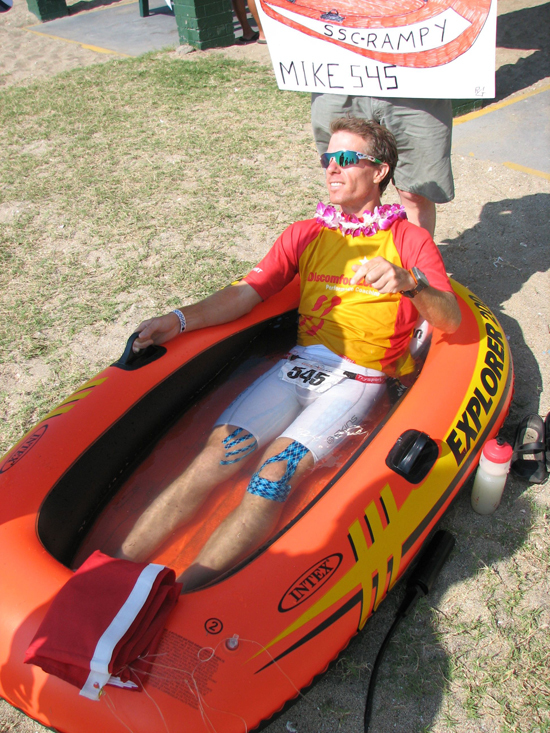 Cory Foulk, 52, Kailua-Kona, completed his 19th Ultraman with a time of 31:17:23. On the women’s side, Laurie Beers, 57, of Kona, completed her third Ultraman in 32:12:12. Ultraman rookie Susan Smith-Nixon, 43, of Waimea, clocked in at 33:12:46. Really caught the flavor of the feeeling at Ultraman from your story Karen. As alwyas great coverage of another event.